It may not look like much, and to be frank, it’s certainly not one of my better photographs (try doing more in a 3 minute bathroom break at 4,800 metres high with a main road running through the shot). But this photo represents a nice circular conclusion to the first three months of our trip. 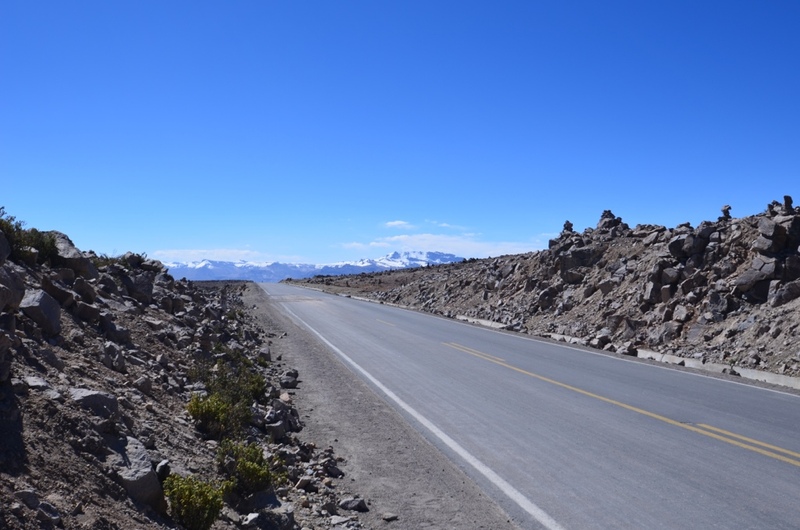 En route from Colca Canyon to Puno on the shores of Lake Titicaca, and from there on to Bolivia and our next chapter, we traversed the Andean Altiplano, seeing some of Peru’s most stunning scenery. The mountain range in the shot is the Mismi range in the Peruvian high Andes, and up there is a small, almost constantly frozen trickle of water. What’s the big deal? It’s not the biggest mountain, or the toughest to ascend, and lots of mountains have frozen streams. Well this frozen stream is the source of a certain river called the Amazon. It nicely draws to a conclusion our 5 weeks in Peru since arriving in Lima from Brazil and the Amazon itself. It’s been a great time and the country has been nothing but welcoming to us. Machu Pichhu was most definitely a highlight, but it was far from the only one. Trekking up in Huarez was stunning, Lima was great and the food was fantastic. But as is always the case with travelling, it’s time to move on, and Bolivia will hold its own challenges and highlights. Can’t wait. Sounds awesome guys. Beats being a work that is for sure! Hope you guys are good, Camo put some picks of your beard up!